The alternative investments referred to on this website are not suitable for all investors. By accepting below you confirm that you are an investment professional, certified high net worth individual (or company etc. ), sophisticated investor or restricted investor for the purposes of the Financial Services and Markets Act 2000 (FSMA). 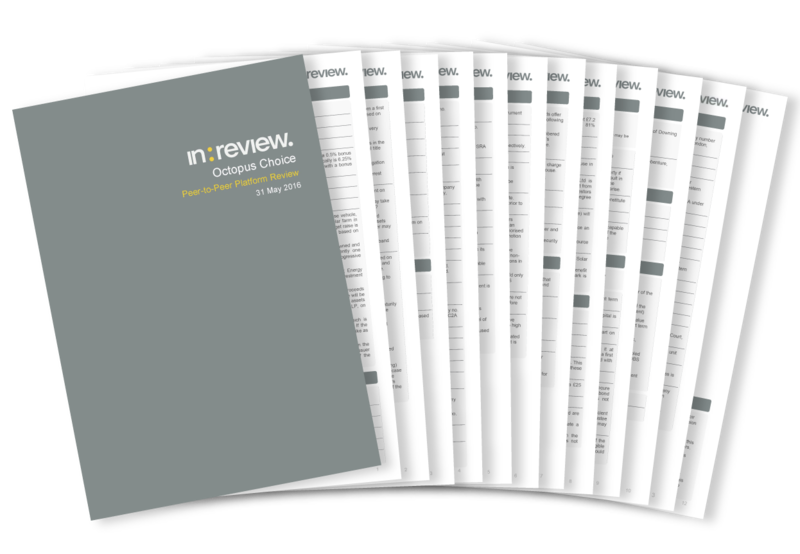 in:review is a trading style of SIPP Investment Platform Ltd (“SIP”), a company registered in England and Wales whose registration number is 07729396 and whose registered office is 2 Civic Drive, Ipswich IP1 2QA. We do not offer investment, legal, tax or any other advice and any information contained within the site should not be construed or interpreted as such. We accept no liability for any loss, expense or other claim based on the interpretation or use of any content within this site. In all cases users should refer to the product and company literature over which we have no control and for which the product providers or SIPP/SSAS operators, as applicable, have full responsibility and liability for. The investments listed in the investment directory are those on which we have completed a review. In addition the directory links through to reports, either simplified or detailed, where available competed by us containing pension-linked information regarding the ability to be held within a pension without tax consequences, the tax situation, liquidity and valuation methodology that will be of interest to pension trustees/operators and financial advisers. The reports are only for the information and use of SIPP/SSAS operators and financial advisers. In all cases, directory listings are for information purposes only and should not be construed as advice or promotion or endorsement of any investment scheme, methodology or provider. Professional advice is always recommended prior to making any investment decisions. For FREE access to the review and all other data and documents we have available on Octopus Choice, please log in or register below. If you are new to in:review, we will create a free account for you to access this review. Once registered, you will have free access to all of the data we hold on this product. We will also mark this offer as a “favourite” and notify you of any significant or material changes. If you have any problems logging in please contact us at support@in-review.com.